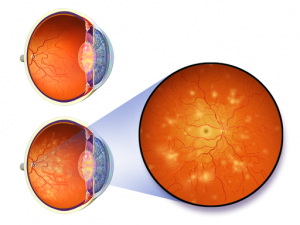 Researchers from Australia and Singapore found that adults with diabetes who drank more than four cans a week of diet soda had almost a twofold risk of developing proliferative diabetic retinopathy (PDR). The study from the Australian Diabetes Management Project was published in the journal Clinical and Experimental Ophthalmology January 23, 2018. Proliferative diabetic retinopathy (PDR) is a progressive disease of the retina of the eye and is the most common cause of vision loss among people with diabetes and a leading cause of blindness among adults of working age. Unfortunately, in its early stages it is not noticeable, but if left untreated can cause extreme vision loss and blindness. Only a comprehensive eye exam can detect the existence of PDR, which is why it is so crucial for diabetics to undergo routine eye exams. In fact, early detection followed by treatment can lower the chance of becoming blind by 95%. There were 609 diabetic community dwelling participants in the study, who were chosen from the Australian Diabetes Management Project. They had both type 1 and type 2 diabetes. Almost a quarter of them had PDR. The participants were offered a Food Frequency Questionnaire and questionnaires on lifestyle and more. The study was conducted in Melbourne, Australia from 2009 to 2010. Those diabetics who drank four or more cans (1.5 liters) a week of diet soft drinks had more than a twofold risk of developing PDR compared to diabetics who did not consume diet soft drinks. The researchers claim that more studies are needed to find out exactly what causes this association of PDR with diet drinks and how artificial sweeteners work to cause increased vision problems for people with diabetes. Previous Studies with diet soda and artificial sweeteners have shown increased risks for metabolic syndrome, Type 2 Diabetes, heart attacks, strokes and death from cardiovascular events. Park Crescent Healthcare and Rehabilitation Center in East Orange, New Jersey offers diabetes monitoring and care for your diabetic loved one. Also, Park Crescent Healthcare and Rehabilitation Center is known far and wide for their expertise in complex wound care, especially for the kind of wounds that are so common to people suffering from diabetes. Since research has shown some very bad health risks for diabetics who consume a lot of diet sodas, it certainly pays to drink less of these kinds of artificially sweetened soft drinks.